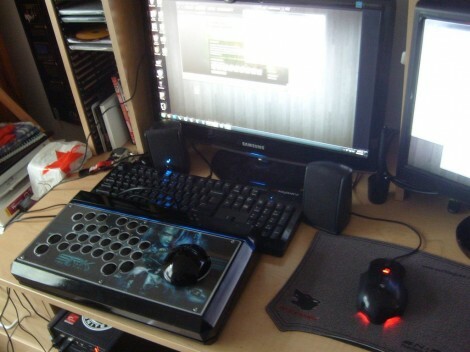 Hmmm I think the contest was to build a sc2 controller similar to arcade fighting game controllers, not FPS controllers. The picture above does not do this justice. It is really pretty. I think it’s the acrylic top plate that detracts from the awesomeness of the rest. It just doesn’t fit with the tron look. What I am interested in is how to actually get the key signals to the computer! I know that it uses USB output, but what IC does it use… what is it coded in? I would love it if it was Arduino. check out the arduino Leonardo. It can do this :) plenty of other things can do it too, but if arduino is what you are after, that’s the board you want. Woah… didn’t know about the Leonardo. Thanks buddy. Will look into it. I think it’s also possible on uno rev3.0 by flashing the “usb-serial-chip” (can’t remember the name), with a modified binary. I was in the shop this was built in, I believe they settled with a cypress board. Wouldn’t using a trackball and grid layout achieve more precission in less space? Great to see Imgur being used for something besides memes for once. I love how we see a bit of each process. I would love one of these for a Diablo or WoW controller. castvee8 liked Aiie! - an embedded Apple //e emulator. Robert asher has followed a list.